Why donate to CASA Academy? You are providing young children in our community with an opportunity for a quality education. There are more than 130,0000 students in our community. Of the 211 schools in our community, only 17 received an A rating from the State Board of Education last year. CASA believes that all students – regardless of ethnicity, language or family income level – deserve the chance to attend a high-quality school. In our community, only 63% of third-graders are currently proficient in math and only 69% of third-graders are currently proficient in reading. CASA’s rigorous academic approach is designed to advance students by more than one year in a single year’s time, setting our scholars on the path to college from a young age. Arizona has the fifth-highest poverty rate in the nation. 96% of CASA students qualify for free or reduced-price lunch, the national indicator of poverty. 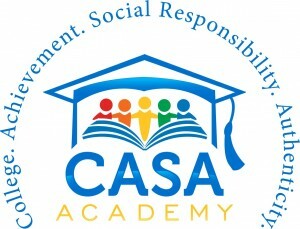 CASA welcomes any student who enters our doors and will never charge a cent in tuition. You are giving young children a strong start on the road to college. In Arizona, 22% of high school students don’t graduate from high school and 55% won’t qualify for public universities. CASA believes that the road to college starts in kindergarten and is committed to providing a rigorous kindergarten program for our community’s children. In 2010, Arizona state lawmakers permanently cut funding for full-day kindergarten. Today, despite countless studies that cite the importance of early childhood intervention, a kindergartner is only worth half as much as any other student. To best prepare our kindergarten students for success in the later grades, CASA must raise more than $125,000 to make up for the deficit caused by Arizona’s half-funding per kindergartner policy. According to Arizona State University, Arizona has the lowest teacher salaries in the nation. CASA believes that teachers are our most important asset. CASA is committed to ensuring that our teachers are provided with competitive salaries and professional development that will dramatically increase student achievement.